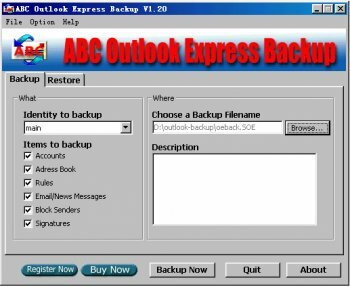 ABC Outlook Express Backup is an easy-to-use tool that allows you to backup and restore your Outlook Express data. It saves email and news messages, address book, rules, email and news accounts, block senders and signatures; and restores the saved data back to Outlook Express. This program is easy to use and has a simplified user interface, very useful for beginners.